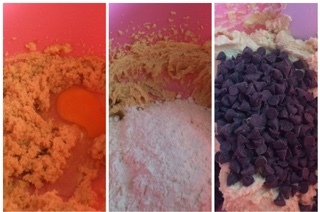 1.Make the cookies dough: In a large bowl, cream sugars and butter, add egg and vanilla and mix well. Add dry ingredients, mix until smooth. Stir in chocolate chips. 2.Scoop dough on baking tray. 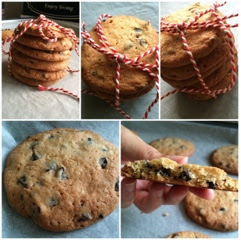 3.Bake: Bake the cookies in preheated oven for 10-12 minutes until golden brown.